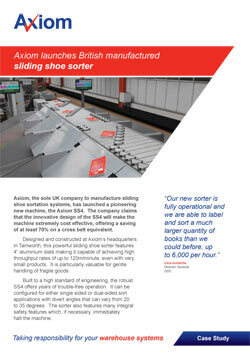 Axiom is the sole UK company to manufacture a sliding shoe sortation system. The Axiom SS4 features an innovative design making it extremely cost effective, with a saving of at least 70% on a cross-belt equivalent. This powerful sliding shoe sorter features 4" aluminium slats making it capable of achieving high throughput rates of up to 120m/minute, even with very small products. It is particularly valuable for gentle handling of fragile goods. Built to a very high standard of engineering, the robust Axiom SS4 sliding shoe sorter offers years of trouble-free operation. It can be configured for either single or dual-sided sort applications with divert angles that can vary from 20 to 35 degrees. "Previously we labelled and sorted our books manually, but increased business meant that it was necessary to invest in an automated system which could reliably deal with the greater volume of books that we now need to process and distribute. We investigated a number of potential suppliers in Germany, Poland and the UK and awarded the contract to Axiom because we were impressed by the performance capability of their recently launched, SS4 sliding shoe sorter." Read the full story on the sliding shoe sorter installed at DDC, a distributing division of leading book publisher, RTC of Romania.